A proposed offshore wind development is generating a lot of discussion in New Jersey. Developers and environmentalists hope to cash in on hundreds of millions in government subsidies while businesses and ratepayers fear offshore wind will result in electricity rate hikes. So far, the 25 megawatt (MW) Fishermen’s Atlantic City Windfarm (FACW) project, three miles off the New Jersey coast, has been denied approval by the New Jersey Board of Public Utilities (BPU) for being too expensive and risky for residents, though FACW continues to work towards an acceptable resolution. A closer look at the proposal shows just how unsustainable wind projects are without the crutch of public subsidies and government mandates. In August of 2010, Governor Chris Christie signed the Offshore Wind Economic Development Act (OWEDA) which directed the BPU to establish an offshore wind renewable energy credit (OREC) program in an effort to develop 1,100 MW of offshore wind capacity for the state by 2020. **Since the availability of wind or solar is dependent on forces outside of the operator’s control, their levelized costs are not directly comparable to those for other technologies although the average annual capacity factor may be similar. Because intermittent technologies do not provide the same contribution to system reliability as technologies that are operator controlled and dispatched, they may require additional system investment as back-up power that are not included in the levelized costs shown below. The offshore wind credits are another interesting part of the equation. Despite the OWEDA being passed in 2010, New Jersey is yet to finalize how to handle offshore wind credit transactions and even how to price them. The offshore wind installation promoters provided a glimpse at just how costly developers feel offshore wind credits have to be in order to make their projects economical. The original offshore wind installation proposal had the energy credits priced at over $250 per MWh credit. 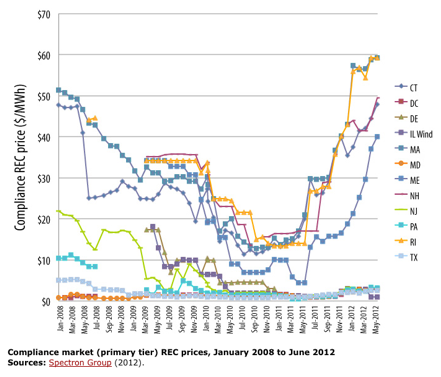 To put that in perspective, New Jersey solar renewable energy credits sold for $125 per MWh in September 2013[iv] and general compliance renewable credits top out at just $60 per MWh. 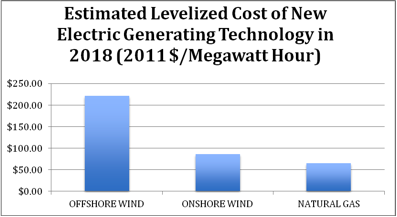 Ignoring the argument of whether there should be ANY renewable energy credit programs, it is obvious that moving to offshore wind is one of the most costly ways to “go green”. FACW claims to have resolved these issues in its latest proposal saying that XEMC has agreed to being subject to the jurisdiction of both federal and New Jersey courts. [xiii] While the integrity of this prospect is still suspect, the bigger point is that FACW is asking for subsidies from the American taxpayer to help a foreign-owned company. This is one more reason the government should get out of the business of providing subsidies. The arguments against offshore wind are plentiful. High costs, reduction of coastal real estate values, negative impacts on fish and bird populations and the technical complexities of the projects are all major obstacles. The FACW project in New Jersey demonstrates once again just how irrational these projects are in the real world. Sadly, they also show just how resilient the market for taxpayer funded, liability free, subsidized development can be. There is no doubt that FACW will continue pressing for a New Jersey funded payday for its Chinese financiers. What is clear is this proposal sounds 100 percent unworthy of American consideration and is instead wholly compatible with the business ideals of communist China. Robbing New Jersey rate-payers to fund these wind farms will undoubtedly raise energy prices in New Jersey and cost taxpayers hundreds of millions for the next 20 years. So far the Board of Public Utilities has seen through the unsustainable promises and misguided optimism of these proposals, but this threat of renewable cronyism is on display nationwide, continues to expand, and must be exposed when possible. IER Policy Associate Landon Stevens authored this post.